« Sew Sweet Simplicity Project Contest!! Cut rick rack or trim 1” longer than width of towel. Pin to towel, about 1” from bottom edge. Sew in place using matching thread. Trace butterfly wing and body pattern 5 times each onto paper side of fusible webbing. Cut out, leaving about 1/8” border around each shape. Place wings on WRONG side of fabrics and iron according to manufacturer’s instructions. Arrange butterfly wings on towel RIGHT side up. Iron in place according to manufacturer’s instructions. 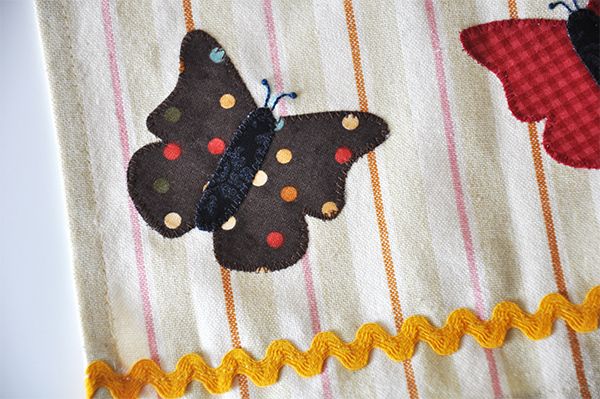 Use matching thread to machine applique wings. Iron the bodies in place, on top of the wings. Machine applique. Use marker to draw antennae. Hand embroider using a back stitch and 2 strands of floss. Make a French knot at end of each antennae. Click here for a PDF of the pattern. This article was posted in Crafts & DIY, Fusible Machine Applique, Sewing & Quilting, Sewing/Quilting Patterns, Spring, Tutorials. Bookmark the permalink. Follow comments with the RSS feed for this post.Post a Comment or leave a trackback: Trackback URL. This is a good project to do on these cold blustery days. Spring will surely come . . . . .surely it will. . .. I love Butterflies Thank you for the pattern. Thankyou for the Butterfly pattern. I can see me making some early Christmas presents. Thanks Jacquelynne for all the freebies and I’m so looking forward to the 2016 Block of the Month program. I had such a great time last year and hope to be able to have time to complete the whole project this year. I’ve so appreciated you giving me the opportunity to vote for you in the March Madness rounds. I feel like it is a small way to give back to you. I just love all your projects and your explanations are so helpful to me. Thank you and God Bless the work of your hands. Thank you for your kindness for all the gifts you give so openly. Oh wow, I was looking for something to decorate some napkins for my elderly mother in law. This design is just perfect, just one butterfly per napkin. She will love them.And: they will not take too long, so I will have time to make them very pretty. Thank-you, Enjoy your mother’s day with your family. Thank You for this beautiful butterfly pattern. 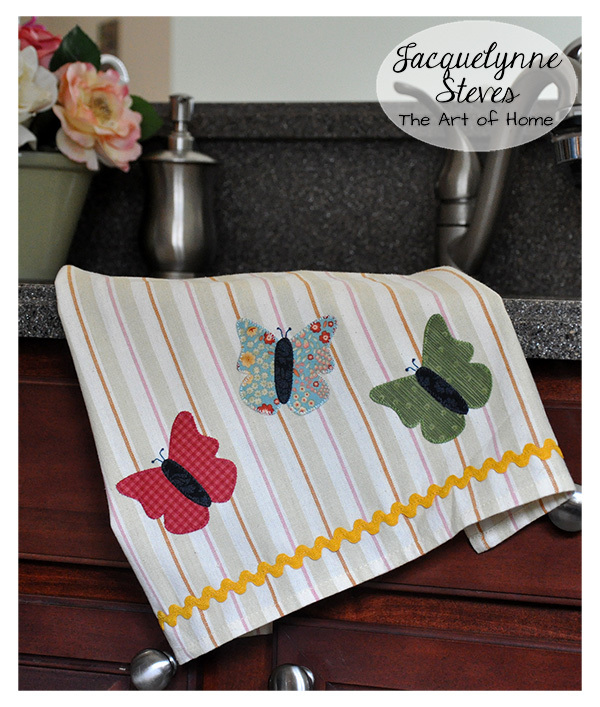 The butterflies are just the right size to add to other little projects too. Hopefully winter will loose its grip soon ;)! I too love anything with butterflies. 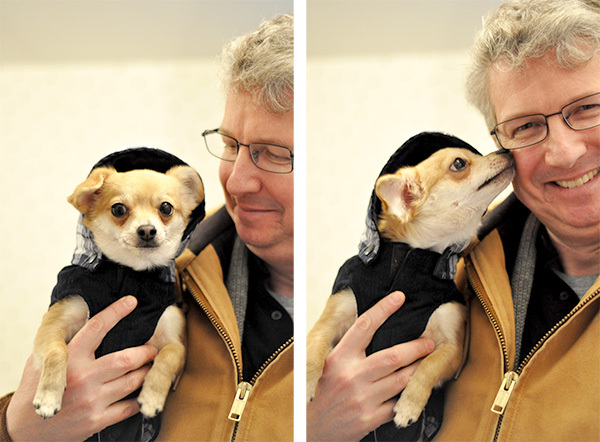 Our doggies have the same sweet face, mine, is more tan, but he too hates his coat, but in Colorado there are days he has to wear it. Wow, I just stumbled across your site and found this! I love it so much.I just started sewing and this will really help me out. I appreciate your gift and Bless you for sharing such great talent. Truly enjoy the visuals, as well as the information. Thank you. I am a, little confused my the comments. Are the dates correct? Love this, was looking for something quick and easy for Mothers Day! Perfect gift. Lovely pattern – will get at this soon. Thank you for the great idea!